The site points out that only 28 percent of Americans know what Memorial Day is about. The rest think it's the day the pool opens. So it's commendable that an organization is trying to remind us that the reason we have this holiday is to honor those who have fallen defending our freedom. Unfortunately, because that organization emanates from the current White House, it stinks of propaganda, from the medal honoring "children of men and women killed in the Global War on Terror" (in many cases because Rumsfeld's Pentagon couldn't or wouldn't buy them adequate body armor) to its "Names of Our Fallen" page for Operation Iraqi Freedom, which hasn't been updated since July 2007. Maybe it just got too exhausting once the numbers neared 4000. "The mystic chords of memory, stretching from every battlefield and patriot grave to every living heart and hearthstone all over this broad land, will yet swell the chorus of the Union, when again touched, as surely they will be, by the better angels of our nature." 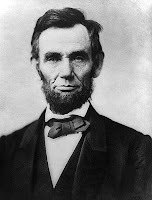 It remains difficult for me to believe that the current inhabitant of the White House, who recently told Politico that he was giving up golf because "playing golf during a war just sends the wrong signal,” even dares to walk the halls Lincoln walked. Which is just one reason why I'm supporting that other little-known senator from Illinois. If all goes well, perhaps the better angels of our nature will live in the White House once again.